Kerala: India’s Bayou & colonial infusion, a set on Flickr. A very late post, with uploaded pictures from a trip to Kerala. The highlight of my brief stay in Trivandrum was repeated trips to the India Coffee House. An institution, which is reminiscent of the tiffin house revolution that swept through the country. Tasty treats and chai spiced to perfection, kept drawing me back to this uniquely-built restaurant. I wandered around across Trivandrum and managed to hop on trains to get up north. In retrospect, I count myself very lucky to have managed this trip with little planning. My philosophy going into that trip, is that plans were most likely going to be foiled with delayed trains, and no prior bookings at bed and breakfasts or reserved train seats. It took me a while to realize that first and second class seats for trains had to be booked weeks in advance. That only left me with the option of taking general class seating cabins, where if you are in luck, you may find a few inches of a bench to sit on. I was lucky my first round, in that I found a group of co-ed students riding the same train. They gave me a lot of helpful tips. They got off a few stops before I did. With their departure, I realized that very few women travel in these compartments on their own. Given the recent headlines of violent crimes and attacks on women across India, I found myself reflecting more and more about this trip and how lucky I was to have traveled in relative peace. It took me 2 train rides to realize that there is a female-only train cabin at the end of each train. Kerala’s backwater are stunningly serene. Way of life meanders leisurely as do the waters of the intricate matrix of man-made and natural lakes and canals that make up this extensive network of backwaters. Depending on where one goes in these stretches of backwater, scenery evokes memories of the Louisiana Bayou or Venice. In another stroke of luck, I met two other travelers who had booked small boat rides from town to town across the backwaters and I managed to tag along. The ride in the small boat allowed us to go through many of the small canals that can’t be traversed by large, tourist boathouses. It was a tranquil trip with plenty of opportunities for bird watching. After a few days of moseying along the backwaters, I took a train up to Fort Cochin. The old fort, still retains many of its colonial influence with borrowed flavors from Portuguese, Chinese and a myriad of traders who passed through. Most eye-catching installations were the Chinese fish nets with gigantic tentacles protruding to the sky. The mammoth contraptions, a dying breed, are still used today across the port of old Kochi. Rising early before dawn, I went by down by the docks and witnessed fisherman heaving ropes and maneuvering the gigantic nets. The rest of Cochin is steeped in British colonial architecture and customs. Thankfully Keralan food did not fall victim to British cuisine influence. Spicy, eye-watering dishes were a welcomed treat. I loved the food so much, I even took a cooking class to learn how to infuse so much flavor into curries and bought a bunch of spies to experiment with when I got home. Sadly time and complicated travel logistics did not give me an opportunity to visit Munar and the famous tea plantations of Kerala. After a week of what turned to be a great pack backing trip across Kerala, I boarded a flight from Cochin and headed for 4 days of wedding festivities in Bangalore. I couldn’t come this far and not get the chance to visit the magnificent Taj Mahal. Many in our group believed that it was a grand mosque and were surprised to find out that this was built by the great Mughal ruler Akbar to honor his wife Mumtaz. She must have been something to have such a monument constructed in her honour. It was beyond expectations. The trip from Delhi to Agra was nauseating. The swerving cars, the constant use of car horns drove me to the brink of insanity. These drivers seem to have their hands permanently attached to their horns. Never really understood the bickering mechanism between various drivers conveyed through the excessive usage of car obnoxious sounds. Nonetheless that was not going to put a damper on my chance to see the Taj Mahal. Upon Arriving at Agra after a 4 hour drive, we rushed in to get our tickets and head over to this great monument. From the boundaries of the city to the ticketing booth, it took more than an hour battling cars, carts, cows and anything on 2-4 legs/wheels. Walking past the grander than life gates, one of 3 that surround the mausoleum, it was hard not to think about the effort was exerted in building this structure; without any modern machinery. The structure is impeccable. I shall let the pictures speak for themselves in this one because nothing I could possibly write can do it justice. After several days in the southern Indian state of Karnataka, I headed up north to the nation’s capital en route to the Himalayan foothills. Luckily it was a Sunday and the infamous Delhi traffic was a bit more bearable. The city has been given a fresh new “wash” if any of you remember the debacle that surrounded the preparations leading up to the Commonwealth Games that took place in 2010. Streets are freshly painted; bright new road signs in 4 languages (Hindi, English,Urdu and Punjabi) adorn the streets; greenery is finely manicured and; the infamous cycle rickshaws, which for me are synonymous with India were conspicuously absent from areas surrounding major tourist destinations. This reality of Delhi was a far cry from what I had imagined. Trying to make most of our day in Delhi we began early by hitting up the major tourist destinations. 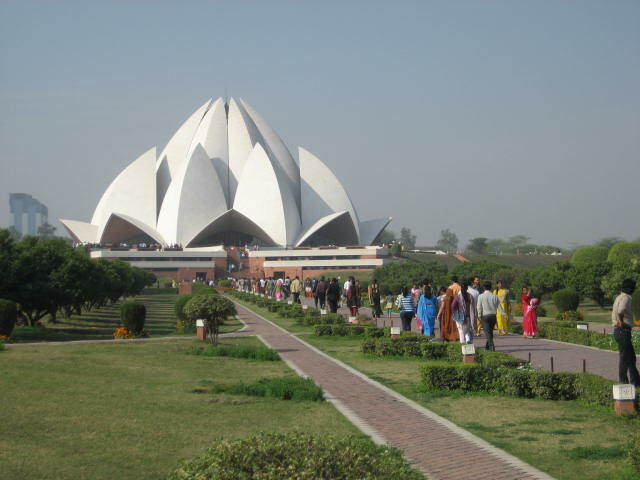 Took sometime to soak in the tranquility of the gardens at the Bahai Lotus Temple, after which we zipped across town and walked around the infamous Red Fort. From there we visited various other parks in the city and of course I couldn’t leave without seeing the magnificent Humayun’s Tomb. After which many of the group members wanted to get some shopping done. So we headed off to discover some of Delhi’s famous street market. After escaping the tourist hotspots and veering into some of the markets, I began to see through the veneer of New Delhi. Through the cracks one could see old Dilli, the city whose boundaries were once confined to the perimeters of the Red Fort; the Dilli that smelt of sweat, spices and sandalwood… and the occasional wafts of stagnant water. This Dilli was far more colorful, one where chaiwallas (tea boys/men) artfully balance giant thermos on one hand and many cups on the other….serving delicious chai masala (spiced tea with milk). From various food vendors around the streets, steam rose swiftly to join the smog created by autorickshaws, motorcycles and cars. navigation through the streets is a skill that must be mastered, not only must you dodge bi,tri and quadrupedal vehicles, you have to worry about the occasional cow or herd of cows. 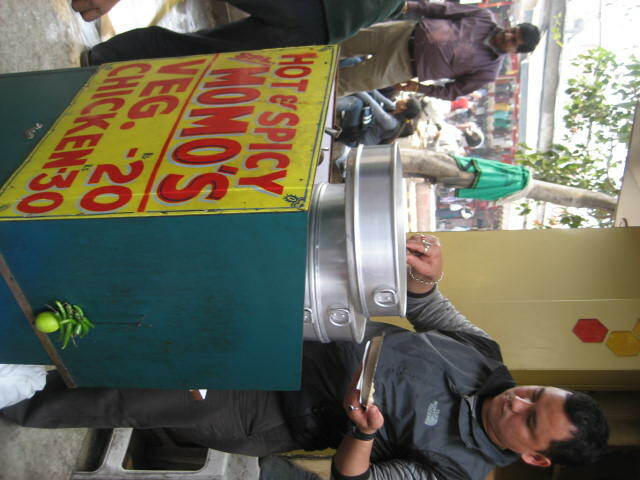 It is here that I discovered my favorite street food….vegetarian momos, which are essentially similar to chinese wontons (steamed dumplings). After an eventful afternoon traversing through local markets, we headed to a shopping center is the district of Guragon (technically part of neibouring Haryana State). The spotless, air-conditioned complexes were akin to massive American style shopping centers. Most of the stores were American or European global brands. The appearance of most shoppers was a stark change from what I had seen earlier in the markets. The distinct kurtas and patiyallas (long cotton shirts and loose pants) were oddly missing. Most shoppers with perfectly coiffed straight hair, marched through the malls in jeans and “western” style clothing. As I eavesdropped on various conversations although the majority were Indian, English was always used as a means of communication. The sight of a ladies trying to juggle numerous shopping bags, a purse, while simultaneously talking on a cell phone or vigorously pounding away at a blackberry was common. It is here that I realized the start difference between Delhi and Dilli. I got the sense that a large swatch of the upwardly mobile population now see traditional customs as somehow backwards or constraining and the push towards “western” way of living is somehow more liberating. All in all it was a great experience visiting the nation’s capital and home the seat of parliment of the “world’s largest democracy.” That phrase was echoed in several conversations I had with various people throughout my stay.